At Port Elizabeth one of the container terminal’s ship-to-shore (STS) gantry cranes was blown off its rails and has ended up partially in the sea at the harbour entrance on Oct 30, 2018. Port Elizabeth experienced winds in excess of 50 knots per hour in the morning. This resulted in the damage of a Transnet Port Terminals ship–to–shore crane on the quayside. No employees were injured. An engineering team was assessing the extent of the damage however, the crane has been secured. A business continuity plan has been implemented in an effort to limit any further impact on operations. The port was shut both on account of the strong winds and also because of the crane wreckage lying across part of the entrance channel. In thee evening of Nov 1 the crane boom (jib) has been successfully floated, brought alongside and secured to the quay wall of the berth opposite the breakwater in the port entrance channel. The debris on the seabed remained to be removed and a final dive inspection conducted ahead of the Harbour Master declaring the port safe for shipping. Subject to good weather conditions and no uncontrollable salvage variables, shipping movements have started and continued on Nov 1. Notice has been given to vessels to prepare themselves for shipping. Three pilots, a berthing crew and our two tugs will be deployed to expedite the recovery of the shipping backlog. The collapse of the IMPSA crane on berth 103 at the PE Container Terminal had left a part overhanging into the port entrance channel. As a result of this and in the interest of navigational safety, all commercial shipping movements in the Port of Port Elizabeth were suspended until the port entrance channel had been cleared. 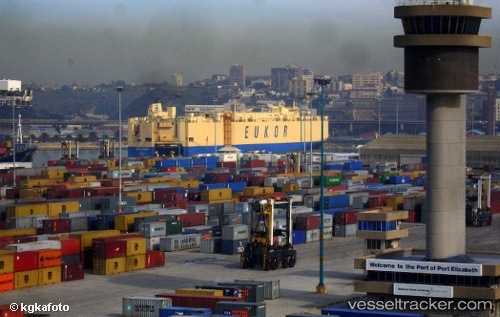 Report with photo: https://africaports.co.za/#35 Meanwhile Transnet Port Terminals (TPT) proceeded with terminal operations. The cargo of four vessels were successfully handled leaving them ready to sail while another five vessels were expected to dock once the entrance was reopened. The port of Port Elizabeth is home to a new R200-million bunkering vessel that will ferry fuel and other supplies to passing ships – a further concrete step in the city’s efforts to tap into the oceans economy. The oil tanker MT Lefkas, the third vessel in the port registered on the South African Ships Register, previously operated under the Liberian flag but will now carry the South African ensign. Its South African registration effectively bolsters efforts to position the country as a shipping nation, in line with the government’s massive Operation Phakisa drive. The vessel docked yesterday morning and will serve as a sea-based fuelling station, servicing all ships passing through Algoa Bay. Owned by Greek shipping company Aegean, the new offshore bunkering operation has the potential to create up to 500 jobs, while pumping millions into the regional economy.